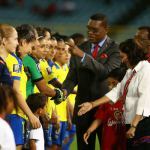 The Trinidad and Tobago Football Association (TTFA) has managed to put together a 13-member squad to face Brazil on December 9 while the “Women Soca Warriors” participate in the “US Victory Tour”, which pits Trinidad and Tobago against the World Cup champions and FIFA’s number one ranked women’s team, the United States, on December 6 and 10. 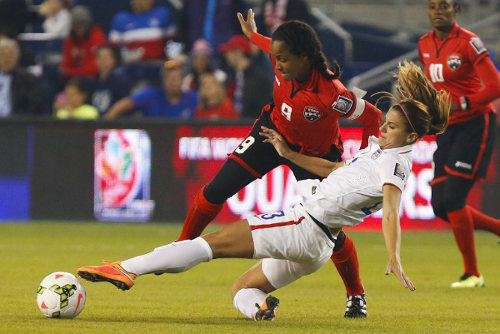 Photo: Trinidad and Tobago captain Maylee Attin-Johnson (left) tussles with United States attacker Alex Morgan (centre) while Tasha St Louis looks on during 2014 CONCACAF action in Kansas City. 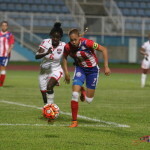 And, tellingly, former national captain Maylee Attin-Johnson confirmed that she will put issues with manager Sharon O’Brien aside to represent her country at the four-team Natal Female International Tournament, which will pit the Women Warriors against Canada, Mexico and Brazil. Attin-Johnson said her decision to compromise, for the sake of the national team and her fans, was based on a chat with TTFA president David John-Williams. “The president and I had a very emotional talk about the entire situation. He said to put football, country and my teammates first and rest assured that, by February, the players will be comfortable. 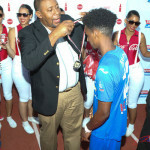 Photo: Trinidad and Tobago Football Association (TTFA) president David John-Williams (centre) presents Naparima College attacker Jarred Dass with his 2015 National Intercol medal. 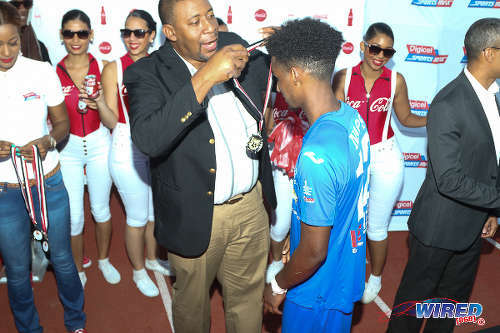 John-Williams might have made a positive start by getting the silky playmaker back in the squad without removing O’Brien, who is team manager, women’s football president and a TTFA board of director. Or at least not removing her yet. The TTFA is expected to investigate complaints about O’Brien from the national squad after their upcoming USA tour and Natal tournament. John-Williams said all parties were part of a clear-the-air meeting on Wednesday but admitted that there was still work to do for a resolution. However, there is still much that can go wrong for the new TTFA president over the next two weeks, as head coach Randy Waldrum, a US native, has admitted concern over his ability to get a Brazil visa and the health of his players. United States citizen are required to get a visa to enter Brazil—as quid pro quo for the US visa system’s rules for Brazilians—and, as the TTFA only received an invitation to the Natal tournament on Tuesday, there is little time to get travel documents for Waldrum and his assistant coach and son, Ben Waldrum, who leave their Houston hometown for Hawaii today. “As of today, I don’t know if I or Ben will get to Brazil,” Waldrum told Wired868. “It usually takes six to eight days to get a visa in the US and, since we are travelling today, we are in no position to get everything that is needed. “We need a yellow fever vaccine and a letter from the TTFA about our reason for going to Brazil and we are not able to do it because we are travelling (to Hawaii). I am not really optimistic. John-Williams suggested that assistant coach Anthony Creece, who travels to Brazil with the makeshift squad for the tournament opener, would end up in charge if the Waldrums do not make it. 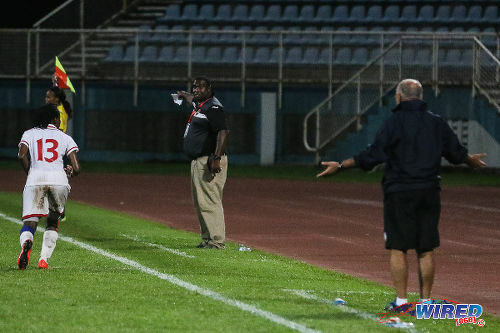 Photo: Trinidad and Tobago interim head coach Anthony Creece (centre) directs right back Annalis Cummings (left) during 2016 Olympic qualifying action at the Ato Boldon Stadium in Couva. The health of the Women Warriors may potentially be a more serious issue, as the players move from being barely active to having as many five international matches in two weeks. “I am really concerned about our fitness levels too,” said Waldrum, “because we have to play the US two games and then there are four games in Brazil. So, from a health standpoint, it is not the best thing. “On the one hand, you need these type of games to prepare properly. On the other hand, we are not really prepared for them. John-Williams, who has been TTFA president for less than a week, said he felt the opportunity to play against the likes of Canada, Mexico and Brazil in a tournament setting—and with all expenses paid by the host nation—was just too valuable to pass up, despite the “challenges” and the possibility of humbling results. 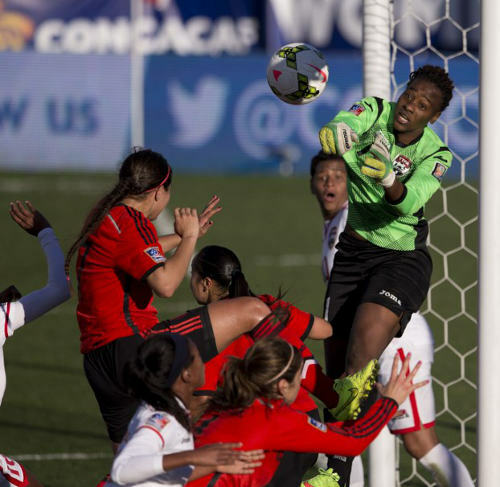 Photo: Trinidad and Tobago goalkeeper Kimika Forbes (right) punches clear of a crowded penalty area during the 2014 CONCACAF Championships third place play off against Mexico. “The objective is not to win in Brazil, the objective is to qualify for the Olympics,” said John-Williams. “When (former 1998 World Cup coach Rene) Simoes was getting hammered as national coach in Jamaica, he said the objective is not to win now, it is to qualify for a world cup. Waldrum said he was grateful for the line-up of international matches before their 2016 Olympics charge. 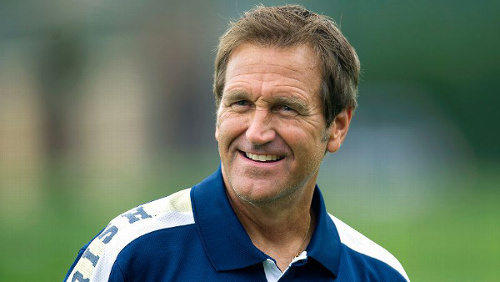 “Last year before the (2015) World Cup qualifiers,” said Waldrum, “we played against the National Under-16 boys team, the (1989) ‘Strike Squad’ (whose players are in their 40s and 50s) and an Under-18 girls team in Dallas. “We need this kind of experience and exposure (against the United States, Brazil, Canada and Mexico) and that is why we felt we had to do it and not worry about the result. 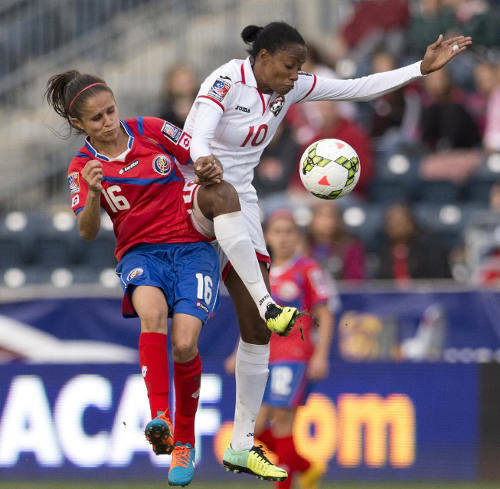 Photo: Trinidad and Tobago attacker Tasha St Louis (right) keeps the ball away from Costa Rica midfielder Katherine Alvarado during the 2014 CONCACAF Women’s Championship semifinals in Chester, Pennsylvania. 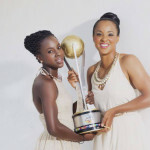 Veteran midfielder Tasha St Louis and three-time TTFA Women’s Player of the Year, Kennya “Yaya” Cordner, will both miss the Brazil trip due to personal obligations elsewhere. 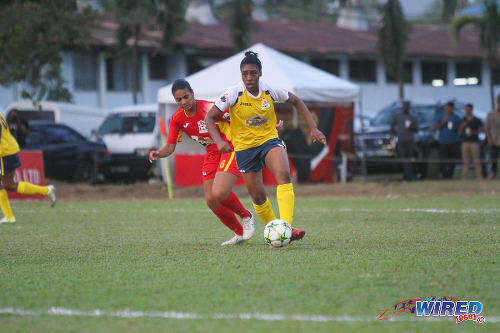 North America-based players Liana Hinds, Danielle Blair and sisters Nia and Amira Walcott will also skip the South American excursion due to work and school commitments. Trinidad and Tobago will play their first friendly against the United States on Sunday December 6 at the Aloha Stadium in Honolulu from 8 pm (ET). The match will be aired on FOX Sports 1 and FOX Sports GO. The second match will be in Texas on Thursday December 10 and kicks off at 8 pm (CT). It will be broadcast on ESPN2 and WatchESPN. T&T: Kimika Forbes, Saundra Baron, Patrice Superville, Lauryn Hutchinson, Arin King (captain), Amira Walcott, Liana Hinds, Danielle Blair, Brianna Ryce, Victoria Swift, Karyn Forbes, Janice Johnson, Nia Walcott, Janine Francois, Khadidra Debesette, Ahkeela Mollon, Tasha St Louis, Kennya Cordner and Mariah Shade. Photo: United States forward Abby Wambach (right) appeals unsuccessfully for a free kick after a challenge from Trinidad and Tobago defender Arin King during the 2014 CONCACAF Championship. T&T: Tenesha Palmer, Shelette Alexander, Maylee Attin-Johnson, Annalis Cummings, Sharain Cummings, Jenelle Cunningham, Joy Daniel, Candice Edwards, Renelle Findley, Shenelle Henry, Tamara Johnson, Jo Marie Lewis, Afiya Mathias and Melissa Woo Ling. Photo: Fuego midfielder Jo-Marie Lewis (right) looks for passing options while Dragons player Rafaela Silva tries to keep up in 2015 WPL action. T&T: Khadidra Debesette, Karyn Forbes, Kimika Forbes, Janine Francois, Lauryn Hutchinson, Janice Johnson, Ahkeela Mollon, Arin King, Brianna Ryce, Mariah Shade, Patrice Superville and Victoria Swift. 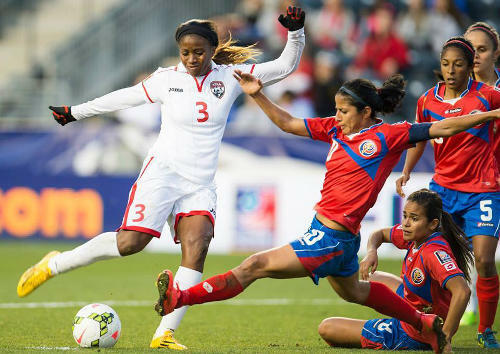 Photo: Trinidad and Tobago striker Mariah Shade (left) has her shot closed down by Costa Rica player Wendy Acosta in the 2014 CONCACAF Championship semifinal. T&T: Randy Waldrum (head coach), Ben Waldrum (assistant coach), Clayton Ince (goalkeeper coach), Michael Taylor (physio), Claire George (equipment manager). 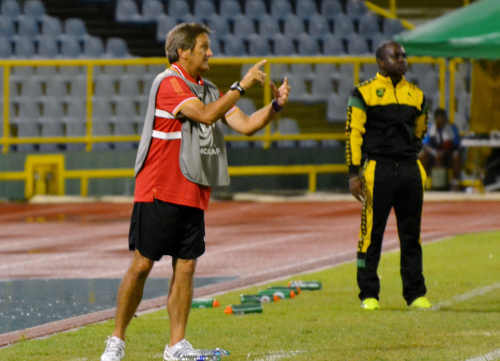 Photo: Trinidad and Tobago coach Randy Waldrum (left) makes a point while Jamaican coach Merron Gordon looks on during the 2014 Caribbean Cup final. T&T: Anthony Creece (coach), Steve Fredericks (equipment manager), Benyam Astorga (trainer), Kendall Walkes (technical director). Despite all of the valid concerns, I think it is worth the risk. Roll the dice, fingers crossed. I feel so too. But it needs proper management and a little luck with this one… We need to come out without injuries and, hopefully, without a humiliating cut tail. Then, I will say it was definitely worth it. I can understand the decision and I can also understand the concerns. But I think I would have made the same call and tried to get the games. Remember the Brazil tournament is all expenses paid as well. FB User 0898 on FIFA/Concacaf delegation meets TTFA Board as concerns grow; but are they here to help football? Or DJW? FB User 1529 on FIFA/Concacaf delegation meets TTFA Board as concerns grow; but are they here to help football? Or DJW? FB User 4895 on FIFA/Concacaf delegation meets TTFA Board as concerns grow; but are they here to help football? Or DJW? FB User 1622 on FIFA/Concacaf delegation meets TTFA Board as concerns grow; but are they here to help football? Or DJW? FB User 8644 on FIFA/Concacaf delegation meets TTFA Board as concerns grow; but are they here to help football? Or DJW?